Send in the sardines. And then more sardines. And don’t forget the phone, with its endlessly tangled cords. Or the British Airways travel bags. Or the box full of letters from tax officials. Or the floral frock. Or the bottles of whiskey. Or the misappropriated bouquets. Or the axe. As you may have deduced by now, the show, which is literally breathtaking and a breathtakingly funny production by Windy City Playhouse, is a bravura exercise in extreme mental and physical comedy. And director Scott Weinstein, who has staged masterful versions of musicals ranging from “Ragtime” to “Titanic” and “Rent,” has deployed his actors here with all the metronome-like precision of a musical, and orchestrated all the door slamming, stair climbing, and pratfall-filled antics with insanely manic energy. At the same time, Weinstein has made sure that each character has a vivid emotional existence. Quite a feat. And while ordinarily I have little love for the conventions of farce, this take on “Noises Off” (and “Nothing On,” its winningly titled play within a play), prove irresistible. On top of everything else, there is Jeffrey D. Kmiec’s wonderfully ingenious set design lit by Mike Durst, along with Jessica Keuhnua’s costumes, Brandon Reed’s sound design and Andrew Hatcher’s props. The action in “Noises Off” unspools in three distinct acts. It begins as the altogether neurotic and wildly unprepared cast of “Nothing On” moves through a travesty of a combined tech and dress rehearsal barely hours before the show is to open. It doesn’t help matters that director Lloyd Dallas (Mike Tepeli, perfectly pretentious and arrogant), is not only distracted by his work on another production (Shakespeare’s “Richard III”), but is also engaged in a couple of affairs with women involved with the show. The play being rehearsed opens as veteran actress and investor Dotty Otley (Amy J. Carle in masterful comic form), plays the role of Mrs. Clackett, an addled housekeeper for a large historic home who must deal with countless plates of sardines, and a phone that will bedevil her throughout. Playing the owners of the home are the high-energy pair of Frederick Fellowes (Scott Duff) as Philip Brent, and Belinda Blair (Amy Rubenstein), as his wife, Flavia, the nervous, self-described “tax exiles” who live in Spain but have come “home” to celebrate their anniversary. Meanwhile, Garry Lejune (the altogether terrific Ryan McBride, whose phenomenal acrobatic feat of tumbling down a staircase is alone worth the price of admission), plays Roger, the real estate agent who is checking up on the house before it is to be shown to potential renters. Roger also is trying to bed his beautiful assistant, Vicki, played by the inept actress Brooke Ashton (the wide-eyed Rochelle Therrien, who races around in a fetching black lace corset and executes some hilarious moves). The play’s second act takes place a month later, at a matinee performance of “Nothing On.” By this time, relations among the actors in the cast are even more frazzled. And we see the insane pandemonium of it all from the perspective of backstage. 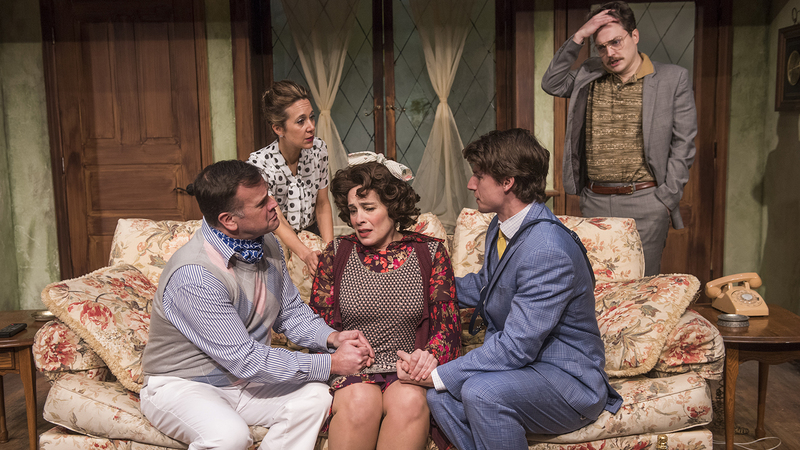 Ordinarily in productions of “Noises Off,” this just means a clever set change, but at Windy City, which has an exceptionally flexible space, the audience actually moves “backstage” to observe the breakneck machinations of a cast gone wild. The third act puts the audience back in its original seats, and proceeds to expose it to the state of “Nothing On” as it plays out near the end of its run. Not surprisingly, the show is in further decline, with ad libs and ever more chaos exacerbating the usual botched cues, frayed relations and overall upheaval. The upended curtain call only confirms things. The sheer logistics of this whole production - a farcical ballet on steroids - suggests that Frayn (who many years after this 1982 work went on to pen the sharply intellectual “Copenhagen”) must have a computer-like brain. And performing the show must be the source of nightmares for every member of the Windy City cast. Yet somehow they get through it all without a glitch - except, of course, for the many hundreds of purposeful glitches that propel it. “Noises Off” runs through March 31 at the Windy City Playhouse, 3014 W. Irving Park Road. For tickets ($45-$85) call (773) 891-8985 or visit www.windycityplayhouse.com. Running time is 2 hours and 30 minutes with two intermissions.